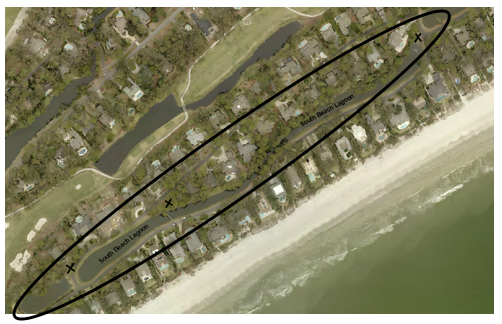 Between November 30th and December 13th, CSA contractors will work to dredge the South Beach Lagoon located near South Beach Lagoon Drive in Sea Pines. Dredging is a mechanical process of removing sediment that has accumulated on the bottom of a lagoon. This process improves the health of the lagoon. Dredging will include the marked lagoons on the map above. Sediment bags will be placed on the Xmarks on the map and the dredging material will need to de-water a couple of days before it can be hauled away. The water level of the lagoon should not be affected, however, there is a possibility of moderate organic odor while dredging is taking place. Pending no inclement weather, work will occur between Thursday November 30th and December 13th ,Monday-Friday from 7 AM- 6 PM. For questions related to this project, please contact the CSA Maintenance Department by email at csamaintenance@csaseapines.com or call (843)671-7849. Thank you for your patience as we make these necessary improvements to this lagoon system.